This is God. 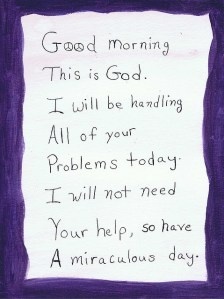 I Will Be Handling All of Your Problems Today. I used to wish I would wake up one morning and see a note like that. Today, I don’t need the note because I believe those words with every inch of my being. I was unable to say that as recently as a month ago. About a month ago, I was still struggling with the concept of putting my will completely in God’s hands. I wanted it, don’t get me wrong, but I was not convinced of it. I played the victim role… I’ve played that role my entire life. When things went wrong, I couldn’t understand why God was letting me down. Now, what I see is this… Things may have been bad, but instead of believing that God let me down, I now see that God helped me through those hard times. I truly believe this. When times are bad, many of us tend to look to place blame outside of ourselves. We cannot understand why bad things keep happening to us. I was over three years sober when I remember looking up to the heavens and asking out loud, “When do the promises start coming true, damnit? !” Those promises were always within my reach, but I neglected to reach out and grasp them. I did everything in my power to work against the principles of the program. Sure, I convinced myself and a lot of other people that I was working so hard. But the truth was, I was wallowing in self-pity and living in my ego. A deadly combination, I might add. How did I get to today? I woke up every morning and went to bed every night by thanking God for the blessings in my life and the blessings I am receiving. Even if I had to struggle to come up with things for which to be thankful, I did it. Before I knew it, I started seeing God’s blessings throughout my life, past and present. I started seeing Him as a loving being, who did not inflict pain on me, but instead, guided me through those hard times, helping me survive each and every difficulty in my life. This was a huge turning point in my life, and in my sobriety. I know now that if I turn my will over to God each and every day, He will not let me down. My faith is restored, and my trust is strong. I am no longer trying to drive the bus. ← Oh… To Wake Up One Day and Know!